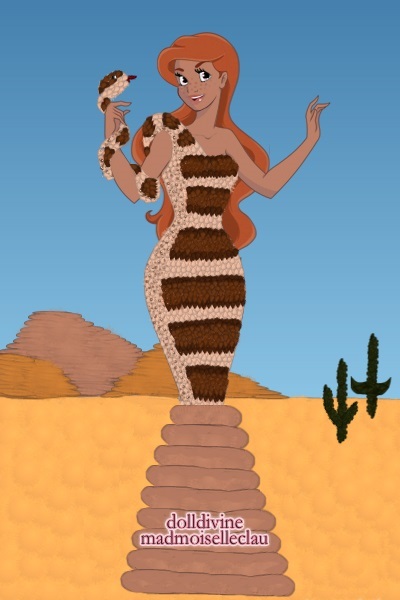 My entry for the latest round of DDNTM using the inspiration "Rattlesnake". First of all, I cannot tell you how much I hate snakes! This doll was still quite fun though, if a bit too challenging for me! That must have taken so long... That is really cool. Great job, very impressive. This is totally awesome! The scales of the snake look so real and you even got the tattle tail. The snakeskin effect is incredible! This dress is so fantastic! Great background, first of all! And fabulous job overcoming your aversion to snakes; my eyes would have gone crazy with all of those scales!! The arm is just inspired! Woah! This is extraordinary! ^_^ I like the dress! Oh guys, thankyou so much! @Astheria, I totally agree, bring on the brush mode! I LOVE this dress, although I'm a little scared of it as well!